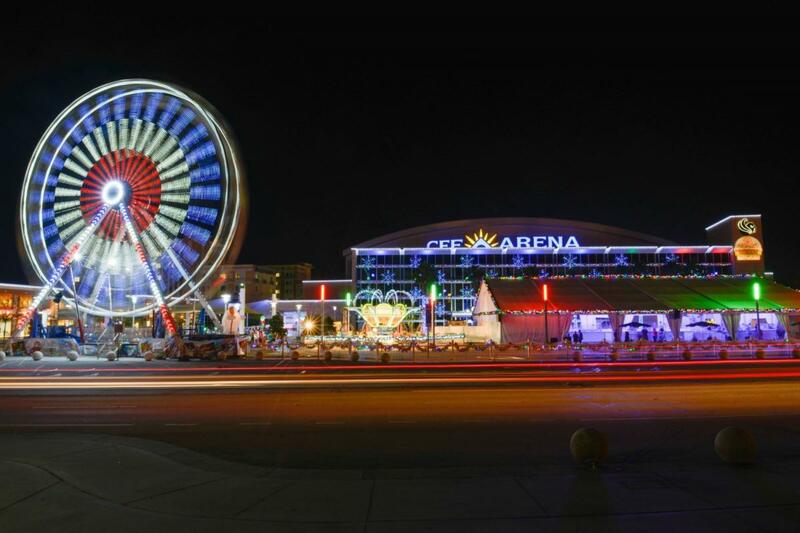 CENTRAL FLORIDA’S ULTIMATE WINTER WONDERLAND LIGHT UP UCF RETURNS FOR ITS ELEVENTH ANNUAL SEASON AT CFE ARENA ON NOVEMBER 16. We’re spreading holiday cheer at CFE Arena and the University of Central Florida with the annual holiday festival, Light Up UCF. The festival will open Friday, November 16 and run through Tuesday, January 1. This year’s festival offers 47 nights of ice skating, a world-class choreographed light show with new music, free holiday movies, live entertainment, rides like the Ferris Wheel and Light Up Express kids train, and much more. At Light Up UCF, there is complimentary fun for all ages to enjoy. Our Holiday Light Show features more than 200,000 lights pulsing and strobing throughout the night in perfect synchronization to holiday songs under snowfall. The Light Up UCF Ice Rink is an ultimate fan favorite returning yet again as a staple of the festivities. The ice rink invites guests to glide along to their favorite Top 40 hits and holiday tunes, played by a live DJ. Tickets for ice skating, rides, and photos with Santa can be purchased at the CFE Arena Box Office. Select tickets are also available for purchase through Ticketmaster or by calling 1-800-745-3000. More information for all Light Up UCF events can be found at www.LightUpUCF.com.